The Lions drafted Auburn RB Kerryon Johnson at No. 43. Overview: Johnson’s brother, Kerrron, is a professional basketball player in Europe and Kerryon was also an all-state player in high school. But it was the gridiron where he truly excelled. Johnson was named Mr. Football in Alabama after rushing for 1,659 yards and 25 touchdowns while leading Madison Academy to its third consecutive state title, and he chose Auburn over Alabama and several other top programs. Johnson saw significant action as a true freshman, rushing for 208 yards and three touchdowns, catching 14 passes and averaging 27.6 yards on 14 kickoff returns. Johnson built on that success in 2016 despite sharing the backfield with Kamryn Pettway, rushing for 895 yards and 11 touchdowns and averaging 22.3 yards on 12 kick returns. With Pettway limited by injury in 2017, Johnson emerged as the lead back. He earned first-team All-SEC honors after racking up 1,391 yards and 18 touchdowns to go along with 24 catches for 194 yards and his first two receiving touchdowns as a Tiger. Johnson did miss two games due to injury, but finished ninth in Heisman Trophy voting and opted to forgo his senior year. Analysis: Johnson shows great patience in the backfield to the extent that it could be a fault. He allows holes to develop and makes the quick decision to attack. He has also displayed good hands as a receiver and wants to stay on the field, even serving as a kick returning during his first two seasons. Johnson isn’t especially elusive and will seek to drop his pads and pick up extra yards. Some of that is due to an inability to avoid contact in tighter spaces, and his upright running style gives some evaluators pause about his durability. He has all the tools to flourish as a three-down back in the NFL, with the biggest question perhaps being how long his body can hold up to the punishment. The 49ers trade into the 44th pick to take Washington WR Dante Pettis. Overview: Son of five-time MLB Gold Glove-winner Gary Pettis and cousin of former St. Louis Rams receiver Austin Pettis, Dante claimed the Huskies’ punt returner job as a true freshman and never looked back. In four years, he returned 93 punts for 1,274 yards (13.7-yard average) and an NCAA-record nine touchdowns. He wasn’t too shabby as a receiver, either, catching 163 balls for 2,256 yards and 24 scores in 53 games (36 starts), including 15 TDs in 2016 alone. A November ankle injury kept him from participating at the Senior Bowl, the NFL Scouting Combine or his pro day. Analysis: Pettis wields a great combination of above-average tools and route-running polish. He can run a full route tree outside or in the slot with nuanced precision, changing speeds and bursting sharply out of breaks. He also shows the ability to track poor throws and catch away from his frame, along with elite vision and acceleration in the open field, especially as a returner. Pettis’ elusiveness indicates speed and burst. Some believe he’s slower than production indicates, but an ankle injury has prevented him from running a 40-yard dash. Other concerns include his slight frame (186 pounds) and lack of play strength -- an issue against press coverage -- plus a large portion of production collected against inferior opponents. Though Pettis’ numbers slipped without John Ross (No. 9 pick overall in 2017) to draw attention, his tape didn’t. He should thrive immediately as a punt returner and become a versatile No. 2 wideout in time. Overview: Iowa was the only major college program to show interest in Jackson out of high school. No cornerback in the nation was more productive in 2017 than Jackson, further illustrating the ability coach Kirk Ferentz and his staff to whip two-star recruits into first-day draft picks. Jackson was an All-American and won the Jack Tatum Award as the nation’s top defensive back. He opted to enter the NFL draft rather than return to Iowa City for his senior season. Jackson led FBS in interceptions, passes defended (26) and returned two picks for TDs in a November loss at Wisconsin, accounting for all the Hawkeyes’ points in the game. Not bad for a guy who was so lightly-regarded coming into the season that he had made precisely one career start at cornerback and was thought of as a wide receiver as late as 2015. Analysis: Jackson’s size and background as a receiver come in handy playing the ball. Contrasted to most defensive backs who are DBs in part because they can’t catch the ball, Jackson can not only blanket receivers, but get the ball back for his team with elite ball skills. His lanky frame will present him with issues covering smaller, quicker receivers mostly if he’s asked to cover in the slot, and his relative inexperience hurt him at times in run containment. But when NFL scouts are comparing you to Hall of Fame defensive back Rod Woodson, one of the best DBs in NFL history, you’re going to be in demand. Brian Gutekunst is going to make us all learn how to pronounce his last name, isn't he. The Bengals trade the 46th pick to the Chiefs. The Chiefs draft Ole Miss DT Breeland Speaks at No. 46, and the Cardinals use the 47th pick on Texas A&M WR Christian Kirk. Overview: Speaks moved from middle linebacker to defensive end as a high senior and became a four-star recruit. He joined teammate Rod Taylor (late-round 2018 OL prospect) by staying in-state with the Rebels. After a redshirt year, Speaks spent two seasons as a part-time starter, totaling 60 tackles (7.0 for loss) and 2.0 sacks from 2015-16 before breaking out with 61 tackles (8.0 for loss) and 7.0 sacks in 2017. At the NFL Scouting Combine, he tied for fourth in the 40-yard dash (4.87 seconds) and vertical jump (32.5") among defenders over 280 pounds. Analysis: Speaks sports an impressive combination of size (6-2 7/8, 283 pounds), length (33 3/4" arms) and athleticism, leading to some outstanding plays on film. He carries his weight well and shows good burst and heavy hands. As his tackle numbers indicate, he finds and pursues the ball well, giving great effort and finishing with a physical edge. He also lined up all over the Rebels’ D-line. Still, Speaks has a long way to go. Long-legged, he usually plays too high, letting blockers into his chest and lacking hand techniques to shed quickly. He shows poor discipline against the run at times and gets washed out of lanes. As a rusher, he mostly ad-libs and relies on physical traits. Other concerns include borderline-dirty play, practice habits and off-field decisions (DUI arrest in March 2016). Still very raw, Speaks shows enticing flashes amid far too many negatives plays. He projects as a boom-or-bust 3-4 end or strong-side 4-3 end who moves inside on passing downs. Overview: A five-star recruit, Kirk chose the Aggies over UCLA so he could play in the SEC, and he delivered as a true freshman with 80 catches for 1,009 yards and seven scores. Primarily a slot receiver, he remained productive through his final two seasons despite inconsistent quarterback play in 2017, finishing with 234 career catches for 2,856 yards and 26 TDs in 39 games (36 starts). He also thrived as a returner, scoring on six of 38 career punt returns and adding another score via kick return. He earned first-team All-SEC honors as a wideout and returner in 2016 and 2017. Analysis: Though short (5-10 3/8), Kirk is well built (201 pounds) and muscular, and he moves with excellent stop-and-start suddenness. He bursts in and out of breaks with great control and is dangerous before and after the catch. His elusiveness pops on punt returns, where he is a demon in the open field. Coaches laud his maturity and professional approach, suggesting a smooth NFL transition. Kirk is not an elite prospect because he might be limited to the slot. He’s certainly not slow, but he’s quicker than fast with a limited catch radius, so he rarely threatens defenses vertically. While he shows strong, natural hands, he was inconsistent in traffic and also must improve his ball security (eight career fumbles). Kirk should contribute from Day 1 as a slot receiver and returner and should be a steady, if not game-breaking, pro. With the 48th pick, the Chargers take USC LB Uchenna Nwosu. Overview: Nwosu quit football in middle school, focusing more on basketball, before returning to the gridiron as linebacker in high school. Viewed as a safety recruit due to a lack of size (185 pounds), he was mostly a special-teamer as a freshman at Southern Cal. After another year as a backup, he produced 3.0 sacks and 7.5 tackles for loss as a junior before collecting 9.5 sacks, 11.5 TFLs and a whopping 14 passes defensed as a senior, earning first-team All-Pac-12 honors in 2017. He was a bit up-and-down at the Senior Bowl, harassing quarterbacks at times but also going through quiet stretches. Analysis: A bit of a one-hit wonder, Nwosu blossomed into a star for the Trojans in 2017. He uses first-step quickness, natural leverage from his shorter stature and 33 5/8-inch arms to threaten the edge. He also shows a knack for batting passes when on quick-timing throws and displays surprisingly good instincts in coverage. Coaches have lauded his growth and maturity over time. However, Nwosu is a liability setting the edge in the run game. He doesn’t show the play strength to consistently hold up, isn’t as speedy in pursuit as his hustle suggests and is inconsistent as a tackler. He also collected many of his sacks against lesser athletes and struggles to adapt when he can’t win with first-step quickness. With a ’tweener body type, Nwosu projects as a 3-4 outside linebacker as he did at USC, but his coverage savvy could lead 4-3 teams to try him off the ball. Either way, he should earn sub-package rushing opportunities. Don't be surprised if the Patriots trade up from No. 51. But don't be surprised if they don't, either. Show no emotion. Your enemies will perceive it as weakness. The Eagles, picking for the first time in this draft, take South Dakota State TE Dallas Goedert at No. 49. Overview: Goedert dominated the Missouri Valley Football Conference and was a man among boys, working his way up from redshirt walk-on to FCS player of the year finalist. Goedert attended a tiny high school in Britton, South Dakota, and played nine-man football. He played various positions including quarterback, wide receiver, linebacker, safety and wide receiver -- but found his way to South Dakota State. In his final two seasons, Goedert posted 164 receptions for 2,404 and 18 touchdowns, averaging nearly 15 yards per catch to earn unanimous all-conference honors and All-America notice. Analysis: A catch-first tight end with enough size potential to develop into an every-down NFL starter despite his relatively weak level of competition at the college level. Goedert proved at the Senior Bowl there is no concern about him working against elite-level athletes. He further showed he belongs with the big boys with a 4.53 40-yard dash time at the NFL Scouting Combine - 1.66 in the first 10 yards - and 10-foot broad jump. A fluid, natural mover with massive mitts and the speed to be a vertical option, Goedert needs to add strength to compete in the trenches at the NFL level. He uses his long arms to smoothly reach and pluck the ball away from his body, and is an athlete who wants it and takes an achiever attitude on and off the field. Gotta love a kicker going full heel. The Cowboys draft Texas OT Connor Williams at No. 50. And the Patriots trade the 51st pick to the Bears. Belichick is going to trade so much the plot of the next National Treasure movie is going to be Nick Cage tracking the return for Jimmy Garoppolo. 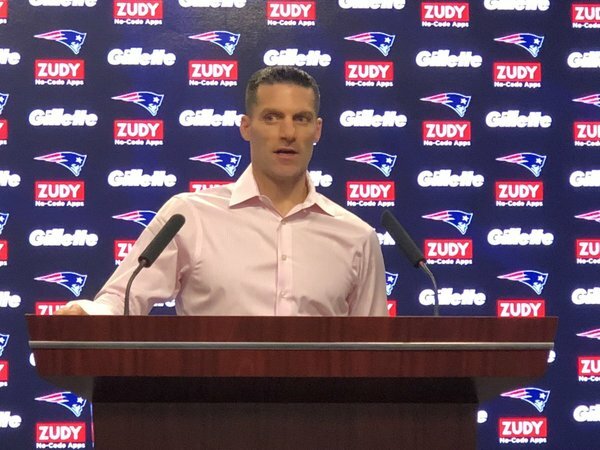 What the Patriots get: 105th pick this year and a 2019 second rounder. What the Bears get: the 51st pick. And with the 51st pick, the Bears take Memphis WR Anthony Miller. Overview: Despite a productive high school career in football and track, Miller went vastly under-recruited. And instead of going the FCS-level route, he decided to bet on himself and walk on at Memphis. Five years later, he is the most prolific wide receiver in school history, breaking several of Isaac Bruce’s Memphis receiving records, finishing with 238 catches for 3,590 yards and 37 receiving scores. Miller’s stats were aided by pass-happy offenses with a pair of draftable quarterbacks (Paxton Lynch, Riley Ferguson) throwing him the ball. But he was able to get open from anywhere on the formation, posting back-to-back seasons with 95-plus catches, 1,400-plus receiving yards and 14-plus touchdown catches as a junior and senior. Analysis: With his speed, ball skills and competitive nature, it is easy to appreciate Miller’s game. He introduces various gears into his routes to lure defenders off-balance, snapping with body control to gain separation. Miller will have focus drops from time-to-time, but his vacuum hands allows him to make acrobatic grabs look routine, bailing out inaccurate passes. Miller is one of the best in this draft class after the catch, quickly transitioning from pass-catcher to ballcarrier to reset his eyes and elude defenders. He proved to be a three-level wideout at Memphis, stressing the defense in the short, intermediary and deep parts of the field. Miller did suffer a Jones fracture in his right foot in the bowl game, sidelining him for the Scouting Combine. As long as the doctors give the all-clear, Miller is a strong contender to be the first senior drafted at his position. I'd understand trading down if you pick up extra picks this year. But to punt on a 2 now for a future 2? How about using that high pick to improve the Patriots' defense? Patriots are on the clock. Traded up to No. 56. The Patriots traded up to No. 56 and drafted Florida CB Duke Dawson. What the Patriots get: pick 56. What the Bucs get: picks 63 and 117. Overview: A four-star recruit who converted to defense as a high school senior, Dawson started one game as a true freshman in a loaded UF secondary. He developed as a boundary cornerback and also played nickel - including six starts as a junior - before a first-team All-SEC season in 2017. Dawson’s performance didn’t reflect the team’s poor 4-7 finish, as he collected a career-high 34 tackles, nine pass breakups and four interceptions. Dawson returned his first pick 48 yards for a touchdown in the season opener against Michigan. After showing well at the Senior Bowl and the combine, Dawson raised his draft stock a bit more. Analysis: Despite a body type which screams safety or running back a lot more than cornerback, Dawson looks ready to handle nickel back duties as a rookie. While he plays bigger than his size, Dawson could be overmatched if asked to handle bigger receivers outside the numbers. Patriots take former Florida CB Duke Dawson at No. 56. One of the better slot corners in the draft. 5-11, 197. 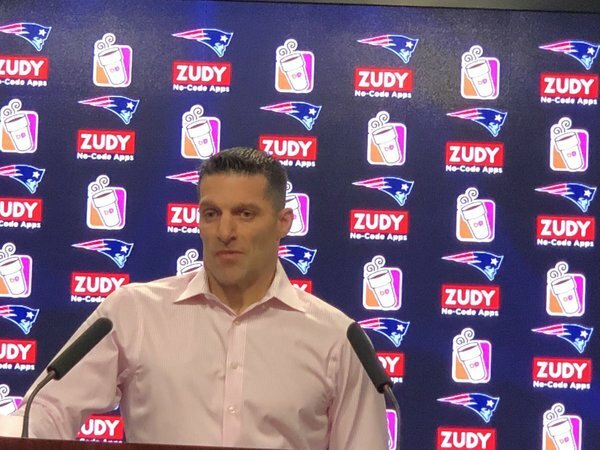 Nick Caserio feels comfortable enough leaving the Patriots draft room to come out and talk with us at 9 p.m. So take that as you will. More on cornerback Duke Dawson: He played in 48 games over four seasons for the Gators, recording six interceptions (three returned for TDs), 23 pass breakups and 82 total tackles. He hails from Cross City, Fla.
Dawson Duke played safety, nickel corner, and cover corner at Florida. Patriots gave up 63 and 117 for 56. Caserio says he doesn’t think there’s any significance in the Titans jumping in front of them two nights in a row. Also says they’re not trying to turn the Garoppolo trade into an untraceable ball of yarn (my words).